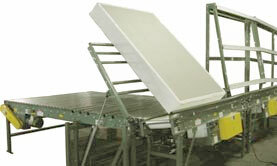 The laydown device is used to lower box springs from a standing position onto a 190-ACC conveyor. The product is conveyed onto the laydown device in the vertical position by means of an inclined 19 RB conveyor and a UHMW dog bone lined A-frame structure. 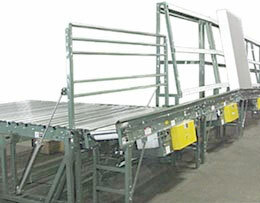 Once the product arrives at the device, the RB stops and the pivot frame is lowered by air cylinders into a 190 ACC conveyor which carries the box springs away. Once the product has cleared the pivot frame is returned to its original upright position in time for the next box springs. Because the pivot point of the pivot frame and the box springs could not be designed at the same location, the cross members of the pivot frame are constructed of round tubing and one 1.7 OD roller. This will prevent damage to the box springs and allow the cross members to fit into the small area between the top of the rollers and the V-belt of the 190-ACC.